One of the neat features we like with Local Scout, the Bing service that shows you things to do around your location, is the tie in with apps. For instance, when you go under eat + drink and pull up a restaurant you can scroll over to Apps to open up the listing in a third party app like Foodspotting. The ability to do that is quite useful as it saves you time in having to go to your favorite app and look up the same information. One change that came with Windows Phone 8 though has us scratching our head, and it’s affecting third party apps, including Liquid Daffodil’s popular Add to Contacts app. Add to Contacts is an app that should be built into the OS but it is not. When you do a search for local business or place to eat, you can’t just add the info to your People Hub. It’s particularly frustrating and a little odd that it has gone missing for so long. Liquid Daffodil made Add to Contacts to address that problem, and as a standalone search app it works just fine. But the app is also supposed to tie into Bing/Local Scout so that when you find an establishment, you can then open it up with Add to Contacts and instantly save the information to your People Hub. 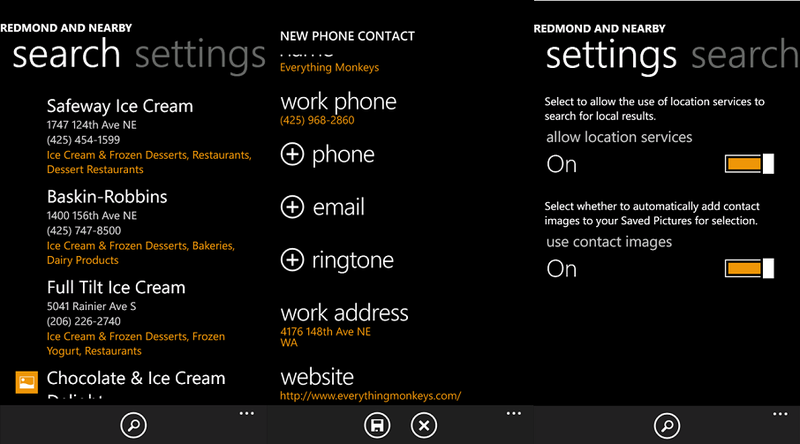 It’s part of the Bing Suggestions option (Bing > Settings > Suggestions) and it can be toggled by users on or off. However, due to a logic change in Windows Phone 8 by Microsoft, Add to Contacts no longer shows up there, neutering its efficacy. This method ensured that your installed apps i.e. 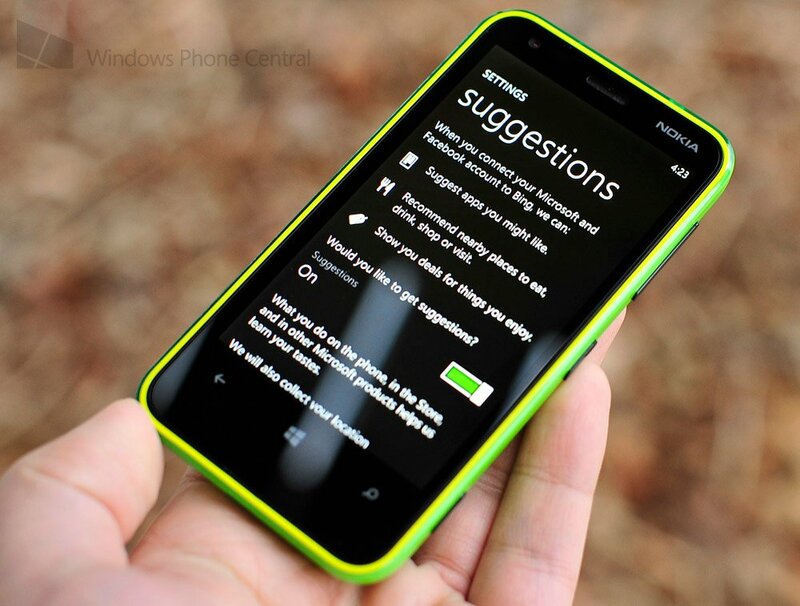 apps that you want to use on a regular basis take priority and are listed over the suggestions/recommendations. While that second category is especially important for app discovery, we can see why it should be placed below what is locally installed on your phone. 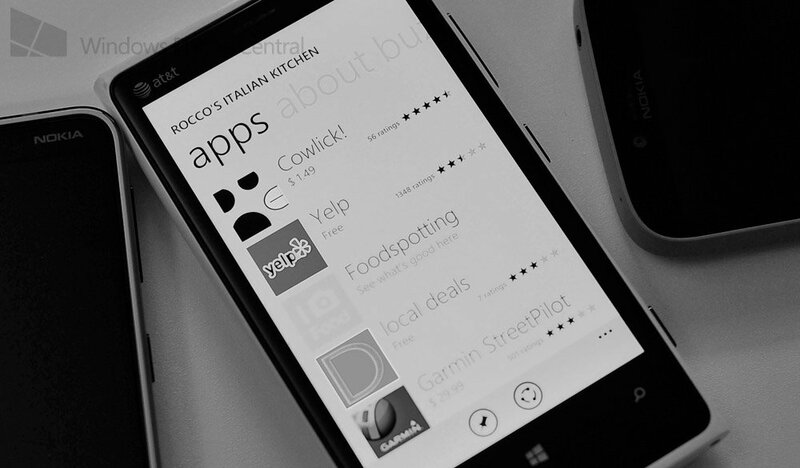 After all, if you installed an app there is a good chance you want it integrated into your Bing Searches and Suggestions. In other words, any user installed apps that could do the job with the contact info will be ignored unless they are very high profile. It’s a weird system because it gives an unfair advantage to prestigious apps like Nokia’s HERE services or Foodspotting but gives virtually no chance to small, third party apps like Add to Contacts (which is rated 4 out of 5 on the Store with negative remarks coming from a failure of this function). Because of this, Liquid Daffodil has made the decision to pull the app shortly from the Windows Phone Store. While it still works as a standalone search app without the integration into Bing, it’s only about half effective for most users. This of course is but one example but in reality it will have an effect on any developer on Windows Phone 8 who makes an app hoping to have it show in Bing Suggestions e.g. Super Contacts. What’s even more odd about the “logic” behind Bing Suggestions is the inconsistency with apps that are presented e.g. for one restaurant we are often seeing Seattlepi.com and Fandango, neither of which has anything to do with the establishment. With Add to Contacts being yanked from the Store in the near future, user will have to find other ways to add new places to their People Hub. Hopefully Microsoft will reverse its stance on this listing logic for suggested Apps in Bing search results because as of right now, it seems a bit unfair to emergent developers. Have you noticed any third party apps no longer showing under Bing App Suggestions? Let us know.